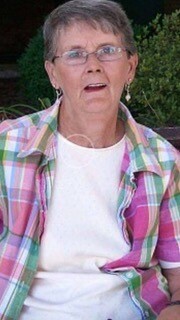 Virginia Russell Clark “Sissy” of Fairview, age 78. Beloved wife, mother, granny, and sister. Passed away on June 30th, 2018. Preceded in death by son, Eddie Wayne Clark Jr.; parents, Preston & Virginia Russell; great-granddaughter, Cadence Palmore; sister-in-law, Jeanette Russell; nephew, Jeffery Russell. She is survived by her husband of 59 years, Eddie Wayne Clark, Sr.; children, Joseph Preston Clark, Lisa Clark Palmore (Robert), and Lorrie Clark Hall (James); grandchildren, Jennifer Lee Palmore, Brandon Wayne Clark, Justin Dale Palmore (Caitlin), Deanna Hall Cunningham (Stephen), Jonathan Parker Palmore (Amber), Preston Douglas Hall (Logan), Bethany Renee Hall, and Joseph Preston Clark II; seven great-grandchildren; siblings, Bobby Russell (Janet), Fred Russell, Fredia Russell Banniza (Jimmy) and Chyril Bobbitt. She was 1958 graduate of East High School, and a member of Calvary Baptist Church, Dickson, TN. She was an avid admirer of thimbles, salt savers, and tea pots. Pallbearers will be Brandon Clark, Justin Palmore, Jonathan Palmore, Preston Hall, Joseph Clark II, and Phillip Minor. Visitation will be held Monday July 2nd from 4 to 8 p.m. and Tuesday from 10 a.m.-2 p.m. at Harpeth Hills Funeral Home. A Celebration of Life Service will be held at 2 p.m. on Tuesday at Harpeth Hills Funeral Home with Michael Parker officiating. Interment to follow at Harpeth Hills Memory Gardens. So sorry to hear of Sissy’s passing. She was such a sweet and gentle soul. Praying for you all during your time of grief. I hope you can find some comfort through the love that everyone is sending. My heart hurts for you all knowing the pain you are feeling right now. May you find peace with all the beautiful memories and love that Granny blessed you with. Thoughts and Prayers to you all. Sorry for your loss. My prayers and thoughts are with the family. Lisa stay strong and put your hands in GOD’S hands. Cherish the good memory you had with your mother. I know it’s hard but the Lord will make a way. Wrapping my arms around y’all from afar since I am not able to be with you.